DETAILS Using paper that is a little more substantial than computer paper (though computer paper will work). 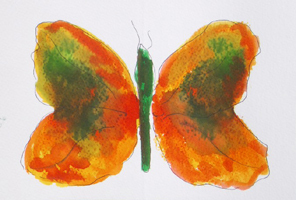 Q tips and food color, create beautiful butterflies. 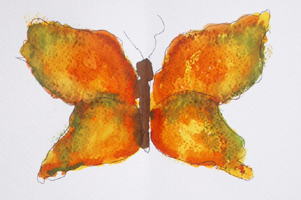 Fold your paper in half, quickly paint a butterfly wing with your first color on one half of the paper, then fold, pressing the painted side into the non painted side. Run your hand over the back of the painted side to create a firm impression. Paint with the next color and repeat the process. Keep adding color and pressing it into the opposite page, until you're satisfied with the results. Be sure to work in small areas at a time or your food coloring will dry and not make a firm impression. 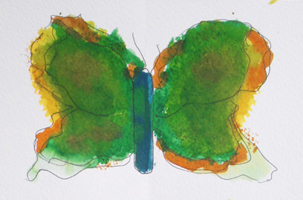 After the image has dried, take a fine pen like a fine rolling ball, and add the details to your butterfly, outlining his wings and body. Choose a color to fill in the body. Be forewarned, most likely you're going to get colored finger tips which will need serious scrubbing. A small price to pay for a great project. A smock isn't a bad idea.